Extra crispy and super easy fried zucchini recipe for the lovers of the authentic Greek cuisine! 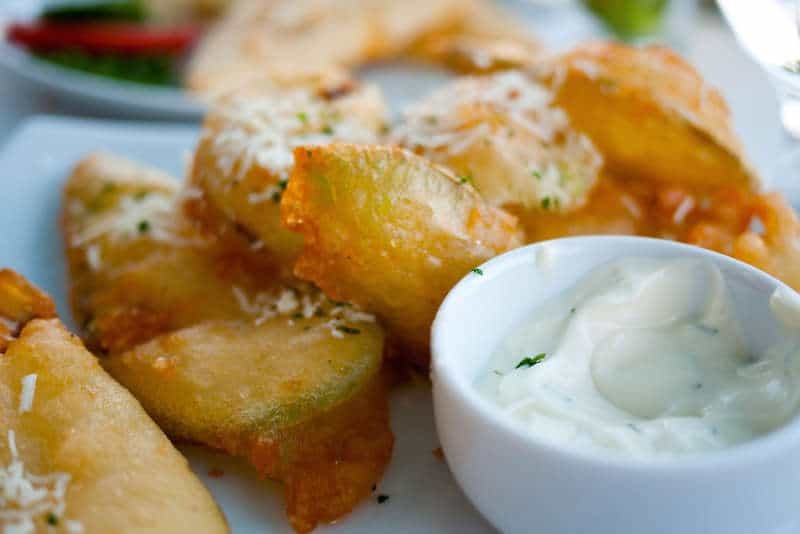 Fried zucchini is a favourite Greek meze that is served in every Greek tavern and you should really give it a try at home. Making your own crispy fried zucchini (kolokithakia tiganita / zucchini fritters ) is literally as easy as frying potatoes! Lots of fried zucchini recipes use batter for coating the zucchinis, but Greeks almost always go for the minimalistic approach. Some good old fashioned flour and seasoning will do the trick every single time! To achieve crispier results make sure you cut the zucchini in thin slices. If your courgettes are large and thick, cut them in slices, but if they are small cut them lengthwise, trying to slice in equal slices so that they are evenly cooked. Zucchini have a lot of moisture in them that can make them soggy when fried. So when preparing this fried zucchini recipe it is important to salt the zucchini and let them sit for about 30-60 minutes. The salt will draw the moisture out of the zucchini, helping it to firm up. And now for the most important part: the frying itself! Use some clean oil for frying and heat it on medium high heat. The perfect temperature to cook the fried zucchini is around 180C. When preparing a fried zucchini recipe it is essential to heat the oil enough. The moisture brought out from the zucchini is what keeps the oil from being absorbed. If the oil isn’t hot enough, then the zucchini will act as a sponge, soaking up the oil, resulting your fried zucchini to become limp and greasy. Check if your oil is ready by carefully dipping one slice in; if it sizzles the oil is ready. Alternatively you can check by sprinkling just a small pinch of flour in the hot oil. If it starts bubbling then it’s ready. Hot oil can be really dangerous, so place the zucchini carefully inside the hot oil. Not overcrowding the pan is vital for crispier results. If you add too many, the temperature of the oil will decrease, resulting your fried zucchini into not cooking properly. Keeping the oil hot will crisp up the outside of your fried zucchini without mushing the middle. The seasoning for the fried zucchini is a matter of preference. Some salt and freshly ground pepper will be just amazing, but adding also seasonings like garlic or paprika will surely lift the flavour. Prepare this delicious Greek fried zucchini recipe for your friends and family and serve as a delicious starter or as part of a meze platter with a last minute squeeze of a lemon and of course a full spoon of tzatziki sauce. Enjoy! To prepare this Greek fried zucchini recipe start by washing the zucchini. Remove the stalks and ends and slice in thin slices, approx. 0.5 cm or lengthwise. (For this fried zucchini recipe the skin is not removed, so make sure to wash it thoroughly). Place the zucchini in a colander along with some salt and set aside for 1 hour to drain. Dredge the zucchini in the flour, place them on a large platter and leave in the fridge for 3-4 hours. At this point the moisture coming out from the zucchini will transform the flour into a batter. If you don’t have the time, just coat them with flour and dip each one separately in a glass of water just before frying. Into a medium sized frying pan pour enough vegetable oil to deep fry the zucchini. Heat the oil to medium high heat until it begins to bubble. Test if the oil is hot enough by dipping one of the zucchini rings in; if it sizzles the oil is ready. For crispy fried zucchini it is best to fry in batches for about 2 minutes, flipping them sides, until nicely coloured. Remove the fried zucchini using a slotted spoon and place on some paper towel to dry for 1-2 minutes. Have a taste and season. Serve while still hot with tzatziki sauce. Enjoy! If you prefer your fried zucchini coated with batter, this is a very easy recipe variation, using beer based batter for coating. To prepare this batter fried zucchini recipe, start by preparing the batter for the fried zucchini. Pour the beer in a large bowl and add the flour (sifted) a little bit at a time whilst whisking, being careful not to get lumpy. The batter for coating the fried zucchini should be more liquid (not firm), so if it’s getting too firm, use less flour than this recipe calls for. Season with salt and pepper, cover the batter with some plastic wrap and place in the fridge for 30 minutes. In the meantime wash the zucchini, remove the stalks and ends and slice in thin slices, approx. 0.5 cm or lengthwise. Place the zucchini in a colander along with some salt and set aside for 15-20 minutes to drain. Pat them dry with some kitchen paper. Dip the zucchini one at a time in the batter and fry on both sides until nicely coloured. Remove the fried zucchini using a slotted spoon and place on some paper towel to dry for 1-2 minutes. Enjoy this delicious batter fried zucchini while still hot with a last minute squeeze of a lemon!